The Hate Report: Could this be the next big, violent protest? A Trump supporter holds an American flag while an anti-fascist group marches into the park during a free speech rally in Berkeley, California, on April 15. In this week’s Hate Report: A rally dubbed “United The Right” has the potential to throw a Virginia city into chaos, a look at why hate crime victims don’t report their attackers to police and an alt-right warrior’s quest for forgiveness. A white nationalist rally planned for Charlottesville, Virginia, next week has the potential to be the latest violent clash between the far-right and far-left. The Unite The Right rally is scheduled to bring speakers such as Richard Spencer and members of the Nationalist Front – which formerly went by the name Aryan Nationalist Alliance – to the city’s Emancipation Park on Aug. 12. The protest is a follow-up to a demonstration in May against the city’s decision to remove a statue of Confederate Gen. Robert E. Lee. Black Lives Matter and an activist coalition called Solidarity Cville view the event as an explicit promotion of white supremacy and plan to bring out a swarm of counterprotesters. A coalition of religious leaders hopes to bring out over 1,000 faith leaders from across the country. The location of the rally, a small park just one block from a major open-air pedestrian shopping corridor, has locals worried. “Sending hundreds of hungry, thirsty, overheated, overcrowded people roaming around downtown, looking for a fight, is a veritable tinderbox. Under such circumstances, something as simple as a car backfiring could turn this into a mass-casualty incident,” dozens of local businesses wrote in a letter to city leaders. Emily Gorcenski, a local activist involved in organizing the counterprotests, is worried that because of the location, violence will spill out into areas where there are preschools and churches. “Our plan for keeping things peaceful is to document everything on social media, to honestly show what’s happening,” Gorcenski said. In a post on the neo-Nazi website The Daily Stormer, a writer going by the handle VallistheGreeks advised attendees not to initiate violence, but to “be ready for a fight” and to “take a battle buddy” in the event violence does break out. Similar events have triggered violence recently. 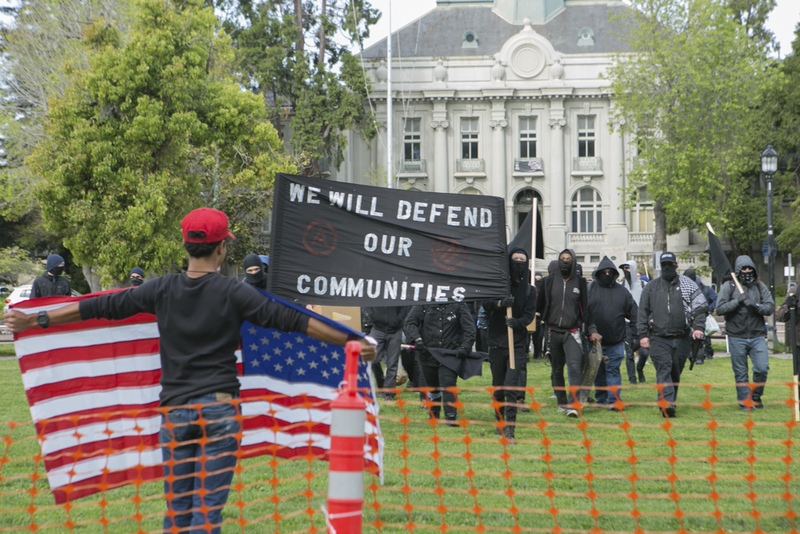 An April “free speech” rally in Berkeley, California, ended with fistfights and arrests. When alt-right provocateur Milo Yiannopoulos spoke on the University of Washington campus, a protester was shot in the stomach. During a May protest in Charlottesville over the removal of the Lee statue, police made a handful of arrests following a brief altercation between demonstrators and counterprotesters. A police officer sustained minor injuries when he was struck in the head while breaking up the scuffle. Jason Kessler, the former Daily Caller writer who organized the United The Right rally, was arrested at that event. He was charged with disorderly conduct for refusing to obey the commands of a law enforcement officer as well as using a megaphone to incite the crowd. A recent report released by the Bureau of Justice Statistics contained a staggering figure: Over half of Americans targeted in hate crimes don’t report the incidents to police. ProPublica’s Ken Schwencke provides some insight into the hurdles many victims face in telling their stories to law enforcement by reviewing stories gathered by the Matthew Shepard Foundation. The foundation collects hate incidents in Denver. Earlier this year, it started asking residents whether they also reported those interactions to police. A gay man harassed with homophobic taunts while shopping told law enforcement, but he was ultimately ticketed for “disturbing the peace” after making his police report. A disabled lesbian whose neighbor tried to hit her with his car feared her report wouldn’t be taken seriously. The report from July 25, 2017 also reads that the suspect abducted the victim from the parking lot of her apartment complex and drove away with her in her car. When they took her driver’s license and found out she was black the suspects “apologized for taking her” and returned her to the complex. The incident report from another case read that the teen suspects forced their victims to strip down to their underwear after robbing them. One of the victims also reported that he had a gun pointed at his chest by one of the suspects. The suspect asked if he knew about ‘Russian Roulette’ and then pulled the trigger. The chamber was empty. South Carolina is one of five states without its own hate crime law. As a result, hate crimes committed in the state have to be handled at the federal level. The federal government has the ability to charge underage suspects with hate crimes, but rarely does so. “It shows South Carolina perhaps is not on pace with the rest of the country in terms of the significance they place on hate crimes,” U.S. Attorney Bill Nettles told WMBF earlier this year. When he showed up for the alt-right rallies in Portland, Oregon, and Berkeley that serve as models for the upcoming Unite The Right rally, John Turano cut a striking figure. 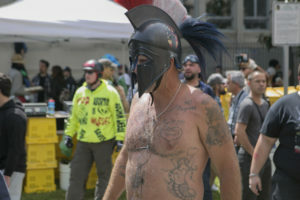 Dressed in the armor of an ancient Spartan warrior (think the heroes of the film “300”), Turano brawled with the far-left antifa and earned the label “beserker of Berkeley” among his alt-right compatriots. However, following a moving encounter with a political opponent in Portland in June, Turano has renounced his alt-right identification and is now protesting on the other side. A gay black man hit in the face with an egg at an anti-Trump rally called the police about it, but “the dispatchers seemed unsympathetic.” A gay man harassed with homophobic taunts while shopping told law enforcement, but he was ultimately ticketed for “disturbing the peace” after making his police report. A disabled lesbian whose neighbor tried to hit her with his car feared her report wouldn’t be taken seriously. South Carolina is one of five states without its own hate crime law. As a result, hate crimes committed in the state have to be handled at the federal level. The federal government has the ability to charge underage suspects with hate crimes, but rarely does so.“It shows South Carolina perhaps is not on pace with the rest of the country in terms of the significance they place on hate crimes,” U.S. Attorney Bill Nettles told WMBF earlier this year.